Bellagio brings a new level of elegance, grace and romance to Las Vegas. Located at the corner of Flamingo and Las Vegas Boulevard, the heart of "The Strip", the hotel’s focal point is an eight-acre lake in front of the hotel, with fountains that dazzle guests with a choreographed ballet of water, music and lights. The Bellagio offers luxurious rooms, gourmet restaurants and upscale shopping along with a healthy dose of cultural enlightenment. 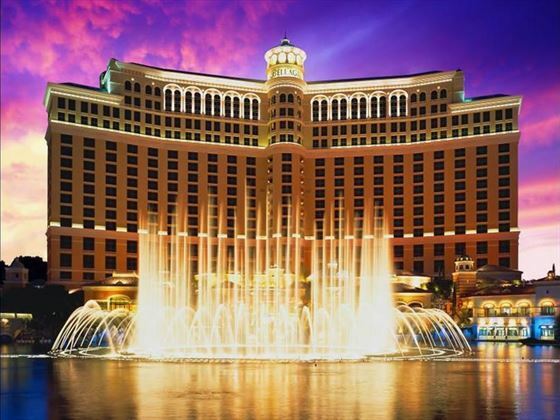 For those looking for a taste of all the finer things in life, the Bellagio is the perfect choice. This sophisticated yet extravagant resort is located on Las Vegas' strip, ideal for immersing yourself in the bright lights of the city. Circo - A rustic taste of Tuscany provides for a romantic Las Vegas restaurant experience. Jasmine - Intrigue is eminent inside this exquisite garden and lake-view destination. Breathe in the exotic aroma of Cantonese, Szechwan and Hunan cuisine. Le Cirque - Winner of the coveted AAA Five Diamond Award, the contemporary French cuisine is rivaled only by the intimate, jewel box setting. Michael Mina - You’re invited to set off on a transcontinental journey of delicious discoveries. Picasso - Chef Serrano’s menu is inspired by the regional cuisine of France and Spain where Picasso spent much of his life. Prime Steakhouse - Steakhouse dining at its finest with prime steak, seafood and lamb accompanied by fabulous sauces, sides and meticulously selected wines. Yellowtail - Bringing a sense of adventure to Japanese fine-dining, Yellowtail Sushi Restaurant & Bar delivers imaginative twists on traditional and modern Japanese cuisine. Sensi - Italian, Asian, American Grill and seafood specialties. Olives - Features a Mediterranean-style experience set against the breathtaking backdrop of Lake Bellagio. FIX - All-American fare! Feast on fish, meat and poultry – prepared to your exacting specifications. Noodles - Authentic regional noodle dishes from Thailand, Japan, China and Vietnam. The Buffet - The freshest ingredients are brought together in an exciting display of taste and talent at the superb Buffet Bellagio. Cafe Bellagio - Breakfast, lunch and dinner are made extraordinary in this exquisite setting offering sweeping views of our Conservatory & Botanical Garden. Need a quick bite? Then try casual fare at Café Gelato, Palio, Palio Pronto, Snacks at the Race & Sports Book or The Pool Café. Marvel at the romantic lure of a Mediterranean-infused al fresco masterpiece – unquestionably Las Vegas’ most inviting pool area. Go for a relaxing dip in peerless azure waters. Five definitive pool courtyard settings invite you to splash into serenity. Spas, an exquisite garden vista café, private cabanas, and poolside massage treatments are also available to complete this outdoor oasis. Resort Fee - Please note that there is a $39 resort fee per room per night payable locally. Lagoons, waterfalls, terraced landscapes, floor-to-ceiling windows, and skylights throughout this 217-acre resort create a tranquil environment. Fine dining, swank shops, a rejuvenating spa and thriving nightlife round out the resort experience. 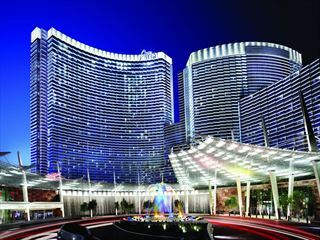 The towering Aria, with its stunning modern architecture, is the perfect choice for a luxurious stay in Vegas. Boasting a massive range of restaurants, bars and a super cool nightclub, you also need to find time to enjoy the casino, spa and beautiful pools.